Energy analyst Chris Nelder argues why the risks associated with investing in fossil fuels companies are considerably larger than researchers think. The topic of stranded assets in the fossil fuel sector is all the rage in climate policy circles, as well it should be. Even so, the discussion has really only scratched the surface of the subject, which deserves much broader attention. But first, a brief history is in order. The concept of stranded assets was born in July 2011 when the UK-based non-profit Carbon Trackerpublished its initial report, “Unburnable Carbon – Are the world’s financial markets carrying a carbon bubble?” It offered some straightforward math for us to consider: To limit planetary warming to 2°C, the world cannot exceed 886 Gt (gigatons) of CO2 emissions from 2000 to 2050. Subtracting the emissions from 2000 through 2010 left a budget of 565 Gt. 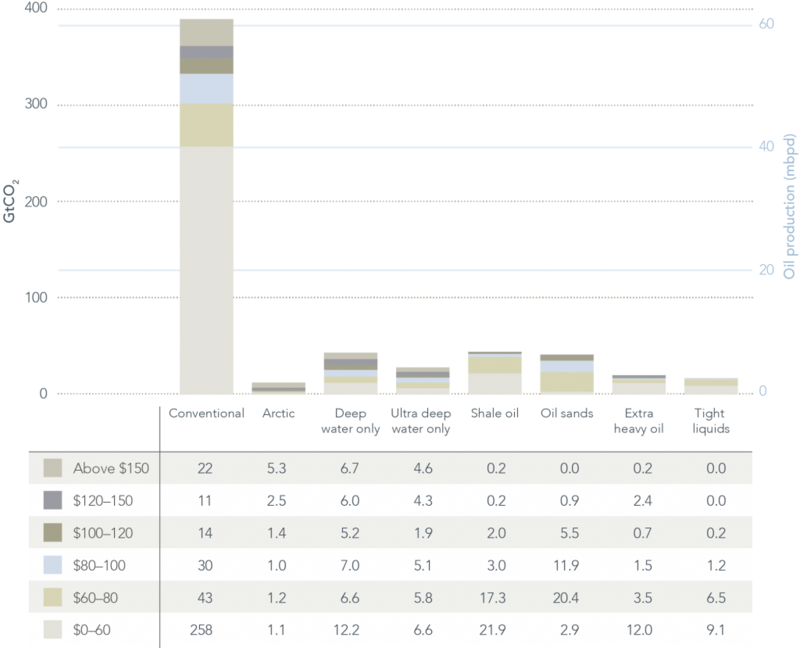 But the reserves of the world’s private and public companies and governments amount to 2795 Gt of potential emissions. Therefore, only 20 percent of the remaining reserves can be burned through 2050 to achieve the desired result. After allowing state entities (nationally owned fossil fuel producers) to maintain a normal share of global production, the 20 percent rule would also apply to the world’s top 100 listed coal companies and the top 100 listed oil and gas companies; only 149 of the 745 Gt on their balance sheets could be consumed. That puts the combined market value of those 200 companies — $7.42 trillion in February 2011 — at risk of “impairment” should the world enact policies to stay under the safe warming limit. Carbon Tracker followed up with an April 2013 report, “Unburnable carbon 2013: Wasted capital and stranded assets,” calling on regulators, investors and governments to prevent a $6 trillion “carbon bubble” from developing over the next decade, and to reconsider the risk of a fossil fuel industry that spends $674 billion a year “to find and develop new potentially stranded assets.” The report mapped the exposure to carbon reserves held on each of the world’s major stock exchanges. Even if carbon capture and sequestration (CCS) technology were deployed under a best-case scenario in which nearly 3,800 CCS projects were running by 2050, it would only begin to take a bite out of emissions after 2030, and so would have little effect, extending the carbon budget by only 125 Gt. The findings reverberated around the world, and investors began taking action. The ethical investment group Ceres began facilitating conversations between investors and fossil fuel companies about how to manage $3 trillion in potentially at-risk assets. Large funds started ditching investments in companies with coal and tar sands assets. The $800 billion Norwegian Petroleum Fund halved its coal investments. Activists began pushing universities and other large investors to divest their fossil fuel interests, following the model that succeeded in helping end apartheid in South Africa. Reports on stranded asset risk were issued by the UK government’s Environmental Audit Committee, the Australia Institute, and the EU Parliament Greens-European Free Alliance Group. Ratings agencies like Standard and Poor’s and Moody’s began worrying aloud that stranded asset risk could lead to credit downgrades. The International Energy Agency (IEA) admitted that a significant fraction of fossil fuel reserves are unburnable, while banks like HSBC and Citi got on board with the thesis. The Stranded Assets Programme at the Smith School of Enterprise and the Environment, headed by Ben Caldecott, also began publishing research papers to quantify the stranded asset risk in various markets and under various scenarios. It also established a research network and launched a series of workshops. A third report from Carbon Tracker, “Carbon Supply Cost Curves: Evaluating Financial Risk to Oil Capital Expenditures,” was released May 8, along with a handy video summary by former Deutsche Bank Climate Change Advisors head of research Mark Fulton, an advisor to Carbon Tracker. That analysis put the stranded asset risk of oil into sharp focus, and encouraged investors to look specifically at the risks associated with $1.1 trillion of capital expenditures planned over the next decade to develop unconventional oil projects which need $95/bbl or more to break even, such as deepwater oil, tar sands, and oil from the Arctic. Through 2050, nearly $13 trillion are expected to be invested in this high-cost, high-risk group, which then would constitute one-third of potential global oil production. Private sector companies would be responsible for three-quarters of it. All told, an estimated $21 trillion of capital expenditures in high-cost production “poses substantial financial risks for investors in oil companies,”wrote Fulton and Reid Capalino, a Senior Energy Analyst with Carbon Tracker, on May 21. The report also quantified how much exposure each of the world’s major oil companies have to each type of oil. The Brazilian national oil company Petrobras, ExxonMobil, the Russian oil company Rosneft, and Shell topped that list for having the greatest exposure to high cost and high risk oil projects. ExxonMobil finally bowed to shareholder pressure on March 31, releasing its first-ever report on the risk that climate change poses to its portfolio. On May 16, Shell issued a similar letter to investors. Predictably, both companies dismissed stranded asset risks because they expect oil demand to override climate concerns for decades into the future, with neither climate policy nor a transition to renewables posing a significant threat to their businesses. Putting an even finer point on the financial risks associated with the fossil fuel industry, Mark Lewis, former Head of Energy Research at Deutsche Bank and an external research advisor to Carbon Tracker, has issued three research notes from his current post at Kepler Cheuvreux, a Paris-based financial services company. 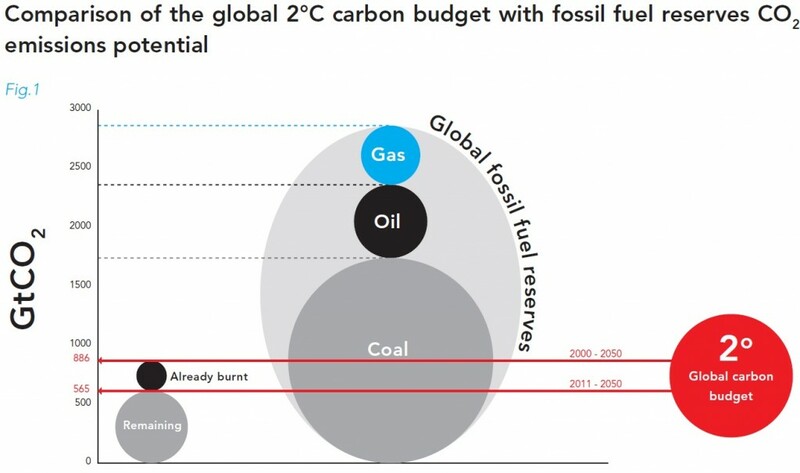 The first, on April 24 (“Stranded assets, fossilised revenues: $28trn of revenues at risk for fossil-fuel industry“), examined how much money the fossil fuel industry would stand to lose under the IEA’s “450 Scenario.” In that scenario, the world takes action to remain under 450 parts per million of CO2, which is thought to be the threshold that would limit the world to 2°C of warming. Lewis calculates that over the next two decades, $19.3 trillion of oil, $4 trillion of gas, and $4.9 trillion of coal revenues would be lost under that scenario, compared to the IEA’s vision of business as usual. On May 21, Lewis went on the attack against Shell and ExxonMobil for their blithe dismissals of stranded asset risk or a possible low-carbon future, calling their approaches “naïvely binary” for focusing only on global climate policy instead of possible regional or national policy, and for failing to recognize the risk that fossil fuels might simply become socially unacceptable and prompt further shareholder revolt. Slamming Shell for its complacency and refusal to engage with investors, Lewis highlighted the obvious hypocrisy in the company’s admitting on the one hand that “our scenarios take as predetermined that climate change will rise up the public and political agenda” and that “regulatory priorities could well be relatively sudden,” while waving away with the other any possibility that the world would not continue to burn oil and gas at more or less historical rates for decades to come. For its part, ExxonMobil has been actively engaged in modeling climate policy risk to its business for many years, and has supported the notion of a carbon tax as a risk mitigation strategy, as ably detailed by Steve Coll in his book Private Empire – ExxonMobil and American Power. He cites a January 11, 2007 email from Ken Cohen, vice president of public and government affairs, saying it would be “prudent to develop and implement strategies that address the risks [of climate change], keeping in mind the central importance of energy to the economies of the world. This includes putting policies in place that start us on a path to reduce emissions…” The company currently faces a proposal sponsored by major shareholders that would require it to set emissions-reduction goals, and assumes that CO2 emissions will be priced at $80/tonne by 2040. The primary scenario examined thus far that might strand fossil fuel assets is one in which oil prices fall as a result of climate regulations; they would have to fall quite substantially (below a roughly $80/bbl production cost). Secondarily, slower growth, particularly in China, and the transition to renewables would also curb demand over the longer term. Only Lewis seems to have recognized another scenario; one in which continued high prices — even continually rising prices — might also strand fossil fuel assets. I believe investors should give this scenario equal weight. There are two factors at work under this scenario. The first, as Lewis explained in his April 24 note, is that “if oil prices rise faster in the future than currently assumed by the IEA in its base-case projections, we think this could lead to an acceleration of the policy incentives for, and deployment of, renewable-energy technologies and energy-efficiency measures.” I have already detailed why I believe the clean energy transition is unstoppable, so I agree with this risk, although I think it applies far more to coal than to oil, and might not apply that much to gas, depending on how grid power evolves. Those who are familiar with my model of oil prices can already guess the second: that prices could rise beyond the pain threshold of consumers, and oil demand could fall off through the mechanism of simple demand destruction and economic contraction — precisely as it did (to some indeterminate extent) in the aftermath of the 2008 crash. Although it’s an understandable and uncontroversial baseline for analysis, it’s also of dubious value to use the IEA’s scenarios as reference, because the agency has a long track record of poor forecasting and overly optimistic scenario construction. Without delving into that deep subject, I’ll just mention that expecting CCS to become a significant factor in the carbon equation is likely straight out of the question, and the future of nuclear power is dour. Even if the IEA’s 450 Scenario could be achieved (and I don’t think it can, for a variety of reasons I won’t elaborate on today) I would still project higher, not lower, prices in real terms by 2035, driven by the increasing cost of oil production. IEA’s oil price forecasts are far too low. Nor would I assume, as Lewis did, that unconventional oil continues to “sells at a discount in the market to conventional crude for a number of reasons, for example because it is landlocked, or because it does not meet refinery specifications.” The global market will sort out those inefficiencies in time. And indeed, it is already the case that some unconventional projects like Suncor’s older operations in the Canadian tar sands could remain profitable at prices well below that of some newer conventional projects in geopolitically challenged locations. I agree conceptually that high-cost projects are the most at risk, and that unconventional projects are generally the highest cost, but it wouldn’t be quite correct for investors to assume that the entire unconventional group would be the first to be shut-in under a 450 scenario. However, I do concur that since unconventional projects are dominated by independent, non-state oil companies, the risk is weighted toward them and to investors in publicly listed companies. Investors must examine closely the full cost of developing new projects — a task made increasingly difficult by oil and gas companies’ increasingly opaque financial statements — and understand exactly which projects are likely to be at risk. For example, I conducted a short examination of exactly how ExxonMobil might fare with its investments in the Canadian tar sands if the Keystone XL (KXL) pipeline failed to materialize. Its two main projects in the tar sands appear to be the Kearl and Cold Lake projects, being developed through its majority stake in Imperial Oil Ltd.
What I found is that all sorts of delays and cost increases have already reduced the expectations for Kearl quite substantially. So from 2008 to 2014, after spending nearly $13 billion and running more than a year over schedule, the Kearl operation achieved a first-quarter production level of 52,000 b/d when 160,000 b/d was expected, is only achieving 70,000 b/d now, and its ultimate capacity has been downgraded from 500,000 b/d to 345,000 b/d. Importantly, the Kearl project’s troubles have nothing to do with the KXL pipeline, nor with carbon policy. They’re simply a function of the difficulty of production and rising costs. And they raise some important questions: How are ExxonMobil/Imperial booking the reserves related to Kearl? Have the claimed reserves changed at all since the 2012 projection? What production output level will the project actually achieve, and when? Will it turn out that cost expansion and delays are actually “stranding” some of those assets in the complete absence of any effective carbon policy? A comprehensive assessment of stranded asset risk would be based on such real-world experiences as the Kearl project, and might point more to a “revenue risk” than “stranded assets” risk, but it could be at least as potent a warning to investors, and a powerful counter-argument to the sunny outlooks on production offered by the oil majors. Current metrics on free cash flow, capital intensity, the crude to natural gas liquid ratios, return on investment, and so on could be even more damning than the unknown risk that as-yet-unformed climate policy might pose at some unknown point in the future. The IEA offered a simultaneously stark and oblique warning on this point in its World Energy Investment Outlook, released June 3. The world will need to invest $53 trillion in energy supply and efficiency to meet its energy needs and get on a 2°C emissions path through 2035, the agency said. More than half of the $40 trillion investment in energy supply will be needed just to keep production flat — “to compensate for declining oil and gas fields and to replace power plants and other equipment that reach the end of their productive life” — including a doubling of investment in upstream oil by the Middle East. Yet the recent trend in the fossil fuel sector has been one of declining, not increasing, investment, underscored most recently by Total’s decision to put its $11 billion Joslyn tar sands project on ice due to cost inflation. And, as Lewis pointed out in his June 6 note (“The $2 Trillion Question: New IEA Capex Numbers Underline Oil-Price Upside”), IEA has increased its estimate for global upstream oil capital expenditures in this report by 20% over its 2013 World Energy Outlook published just seven months ago but did not raise its oil price forecast. Not only is this “counter-intuitive,” as Lewis observes, I would plainly call it a false signal. Oil prices will need to be considerably higher over the next 20 years — a time in which I expect global oil supply to be declining — to realize the IEA’s investment scenario, even if over 90 percent of the spending on upstream oil were strictly to stem declines, as the agency expects. More likely is that the world will not invest sufficiently in future oil supply — a risk IEA acknowledges — driving prices up far more quickly than the world can adjust to and kicking off a long period of price volatility as oil producers and consumers struggle to maintain a grip on the “narrow ledge.” That volatility alone would strand assets and starve upstream projects of investment. Further useful information might be gleaned from a close examination of the models oil and gas companies use to forecast production, and of the models put forward by agencies like the U.S. Energy Information Administration (EIA) to estimate reserves. For example, on May 20, EIA slashed its estimate for the recoverable oil in California’s Monterey Shale formation by over 95 percent. I believe it did so because David Hughes’ careful examination of the formation last year, which I wrote up in December, shamed them into it. Investors in U.S. unconventional oil should note that Hughes’ model indicates a tight oil peak around 2016, five years earlier than EIA projects (see “Oil majors are whistling past the graveyard“). While the vast majority of the work on stranded assets so far has revolved around oil and gas, in my view the most immediate stranded asset risk is in grid power — a point underlined by President Obama’s new climate plan, which takes clear aim at coal power. Since existing coal and nuclear power plants are being rapidly retired, new nuclear plants in the United States and Europe are expected to generate power at more than twice the cost of new wind and solar plants, and the developing world is increasingly choosing renewables (in India, partly due to a lack of coal), the lack of attention paid to grid power in the stranded assets dialogue seems a curious oversight. Perhaps it owes to the fact that nearly all of the stranded asset research thus far has emanated from the UK, where power generators face a somewhat different set of challenges. But I suspect that the first trillion dollars’ worth of stranded assets will be in the grid power sector, not in oil and gas languishing underground. A quick look at the stock charts of major coal companies tells that story nicely. Note, too, that Barclays just downgraded high-grade corporate bonds across the entire U.S. utility sector, citing the emerging threat of solar power and storage. The latest Carbon Tracker report, “The Great Coal Cap – China’s energy policies and the financial implications for thermal coal” (PDF summary), released June 5, finally takes aim at stranded asset risk in the grid power sector. Up to 127 gigawatts (GW) of existing coal-fired capacity and 310 GW of expected future capacity, equivalent to 40 percent of the total installed coal-fired capacity by the end of this decade, could be stranded in the Asian nation as demand falls due to moderating economic growth, increased competition from cleaner fuels, and carbon policy. But these are not merely future risks; they’re in the present. A report from Bloomberg released the previous day said that the economy in Shanxi province, which is “all about coal,” is tanking as anti-pollution policies begin to curb coal use. Understanding grid power stranded asset risk is a difficult undertaking. In the United States alone, it would requiring painstaking research in dozens of different power markets with hundreds (or thousands, depending on the granularity of your research) of generators and a complex web of regulations. But it’s an effort worth making if you’re running a major pension fund. In my view, it’s far more likely that carbon assets will be stranded by the falling costs and increasing deployment of renewables, somewhat irrespective of carbon policy, and that it will proceed from coal, to gas, and finally oil. And the main risk to oil assets will be consumer price tolerance, not climate policy. I also think natural gas use in the OECD will be greater than is generally assumed, while its use in non-OECD countries will be considerably lower than expected as parts of the world that still lack reliable electricity leapfrog fossil fuels and go straight to renewables. So while the full stranded assets picture is complex, the take-home message is simple enough: Fossil fuels are on their way out, and renewables are coming on strong. This is irreversible. The entire universe of stranded fossil fuel assets is much, much larger than the research thus far has contemplated. The only real question is who’s going to wind up holding the bag. 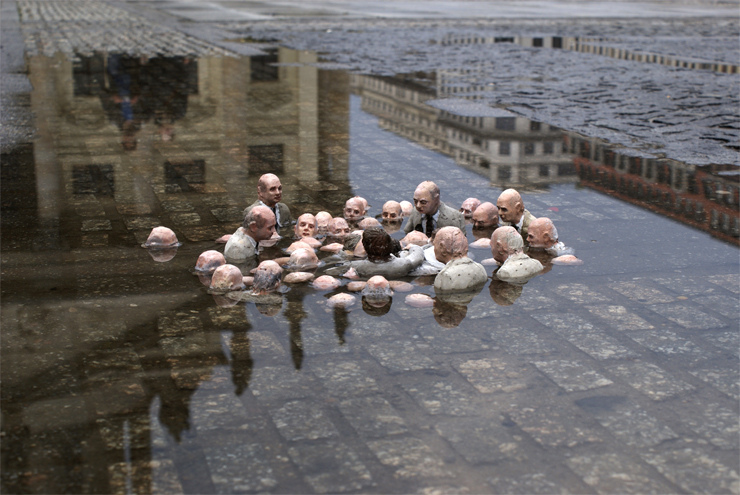 Photo: “Electoral Campaign,” sculpture by Isaac Cordal. Used by permission of the artist.